For long I’ve fantasized about Greece: island hopping, soaking up sun, eating fresh fish while the sun dipped into the Mediterranean. Last October I finally got to go. 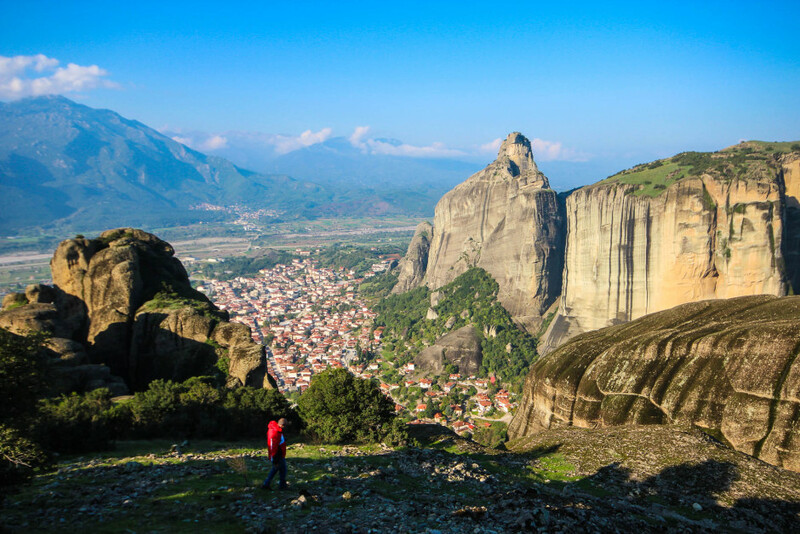 But instead of seaside lounging, I headed for the mountains of Thessaly, the stone forest of Meteora, and a tour of Athens. I’m glad I did. There’s far more to this country than just beaches and seafood. Here in Kalambaka, in Greece's Thessaly Region, 14th century orthodox monasteries crown stone pillars hundreds of feet in the air. Of the original 24 structures, only six remain today. 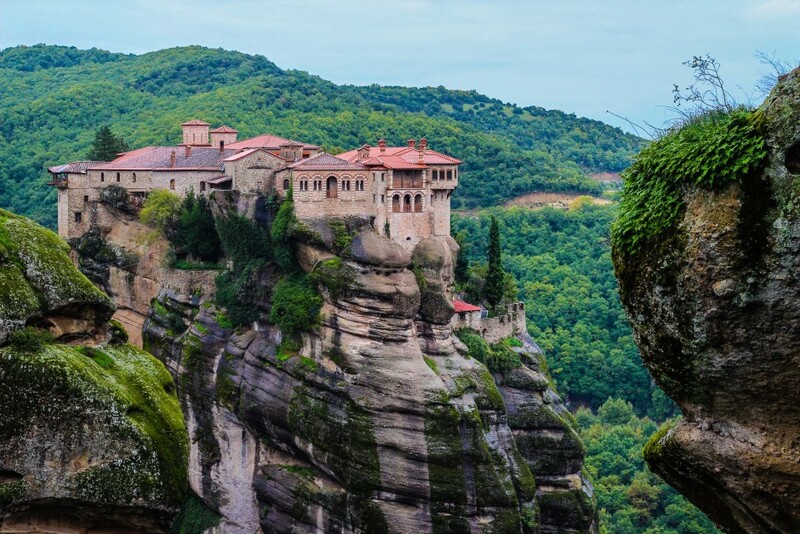 Pictured here, the Roussanou Monastery, built by two brothers in 1545 atop a pre- existing church. Saganaki, a fried hard cheese, quickly became a staple on my trip: salty, satisfying and best eaten with a squeeze of lemon. 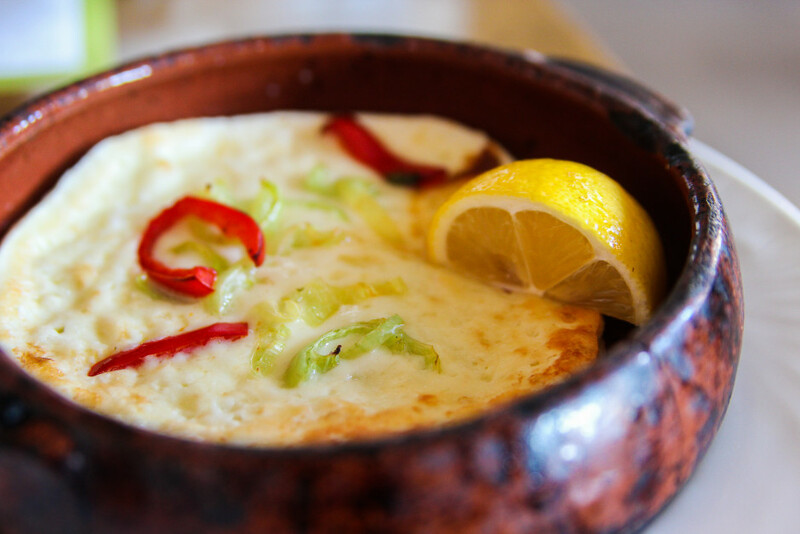 This shot of cheesy goodness is from Erato Wine Restaurant in Litochoro, a village in Mt. Olympus' shadow with azure views of the Aegean Sea. 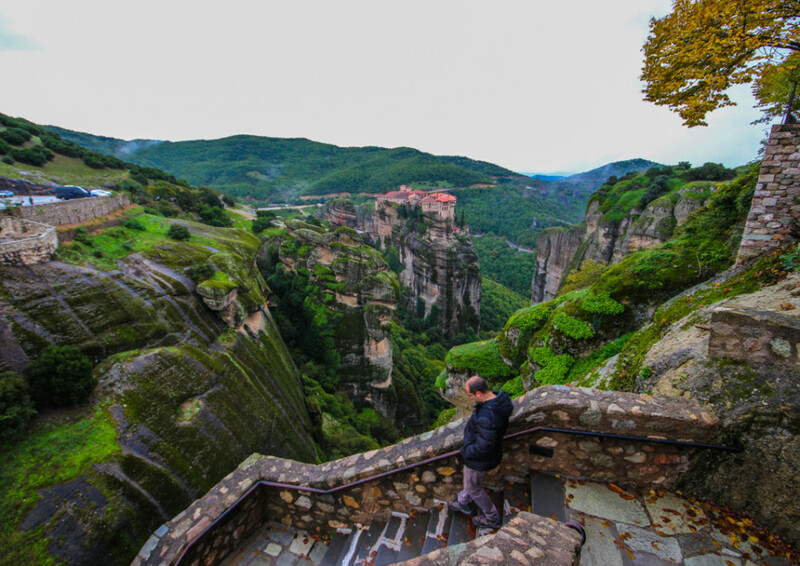 There are 22 miles of local trails at Meteora. My guide Kostas led our group through oak woodlands flecked with wild mushrooms and up stone slabs for panoramic views. The previous day, we toured the Meteora Natural History and Mushroom Museum, and enjoyed a unique fireside dinner of wild mushroom-based dishes at Neromilos. Being able to then identify various fungi during our hike was an unexpected thrill. Kostas was full of comedic stories, including one about this cave, which apparently imprisoned misbehaving monks. 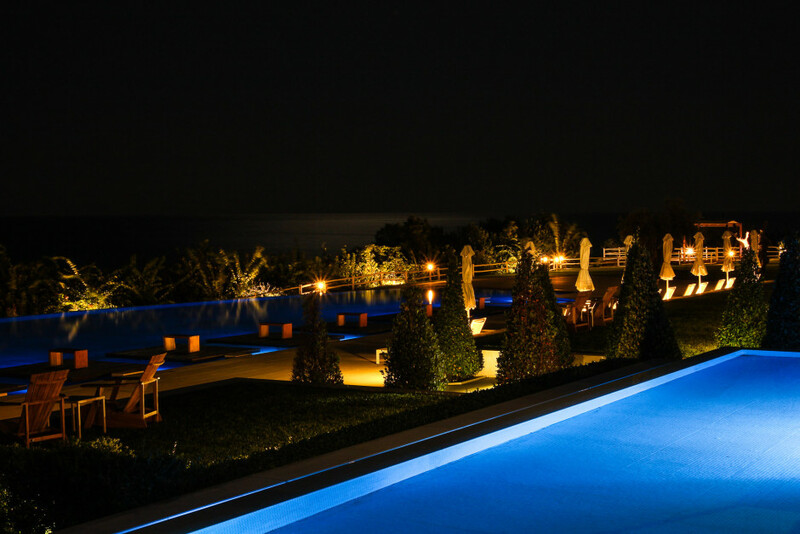 Two hours north of Meteora sits the Pieria region’s only five star hotel, the Cavo Olympo. 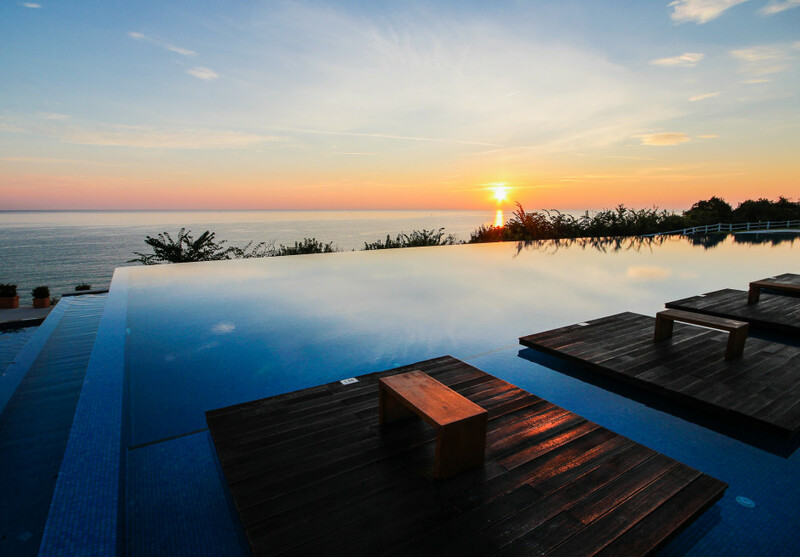 Multi-tiered pools and terraces led to the pebbly beached Aegean Sea at the hotel's rear; to the west, Mt. Olympus. Aside from the views Cavo Olympo's restaurant, Nero, serves excellent cuisine. Their pancetta of local black pig with celery cream, beetroot, and red wine sauce blended traditional heartiness with gourmet flair. Foul weather created a moody, brooding scene that spoke to my introspective side. Wispy clouds slunk in and out of gaps between pillars; the craggy formations at once hidden and then revealed. If anything it made moments of sunshine all the more glorious and dramatic. I would recommend a knowledgeable guide to help grasp the history of Athens. While organized tours have never been my thing, Athens Walking Tours was very welcome. My guide, Hermes, was a quick-witted fountain of knowledge. 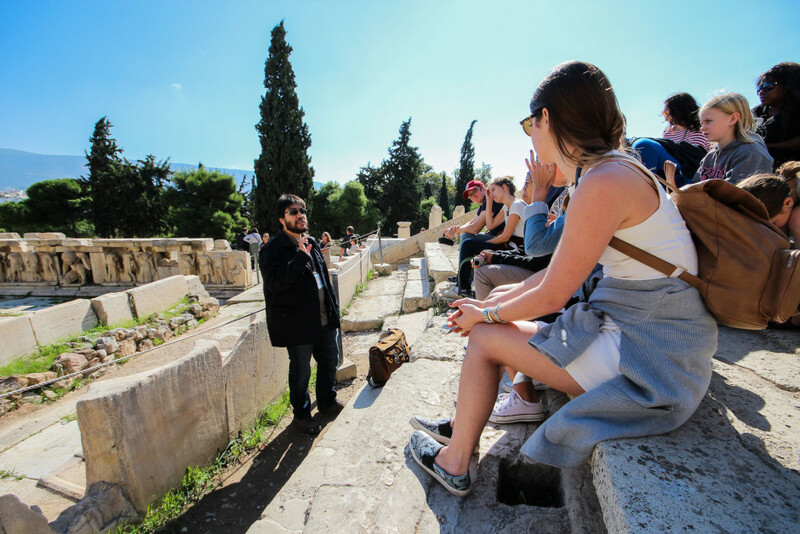 In this photo, below the Acropolis at the Theatre of Dionysus, he explains the role theatrical performances played in ancient Greek society. Making my own flaky spanakopita and stuffed grape leaves with Athens Cooking Classes, also left me with a new appreciation for guided travel experiences. While we didn't climb anything more technical than this, there are over 600 routes for climbers of every ability on pebbly sandstone-conglomerate. 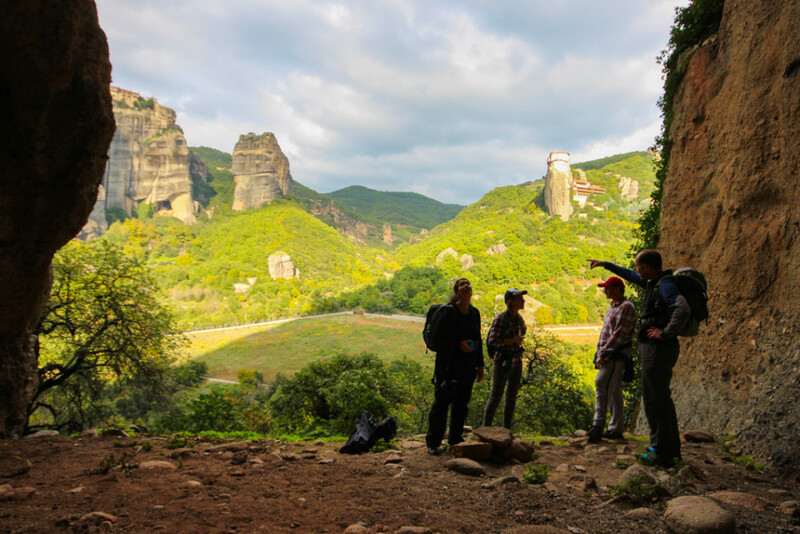 "60 million years ago an inland sea surrounded by mountains was here," explained George Kourealis, our local guide from Visit Meteora. "The Pineos River deposited sediment and round stones in the delta. 25 million years ago an earthquake broke the mountains and water flowed to the Aegean Sea. Over millions of years wind, water, and ice slowly gave us these bizarre shapes. When I was a kid we played around here. We found fossilized shells. It was a fantastic place for a boy to grow up." Of all the tasty Greek specialties, the salads - which accompanied every meal in myriad forms - were my favorite. Greek salad was always on hand. 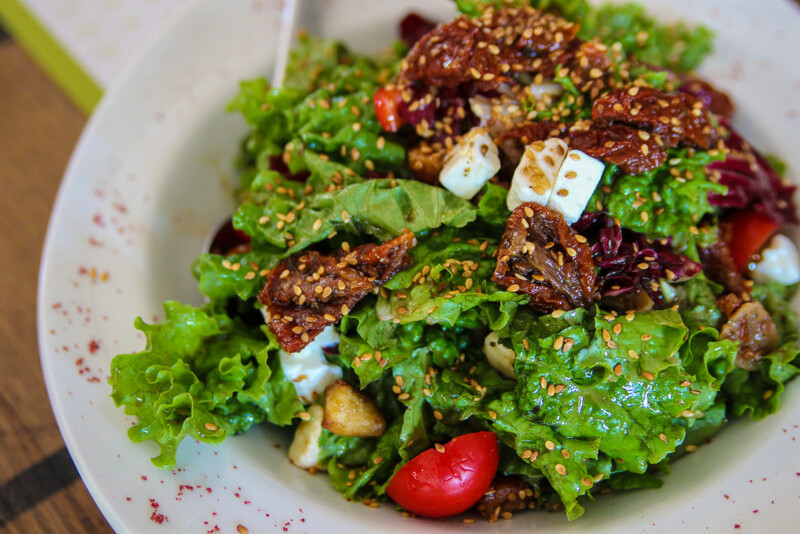 Here's one from the Meteora Restaurant featuring sun-dried tomatoes and sesame seeds. Here George Kourealis leads me to a lookout over his hometown of Kalambaka. 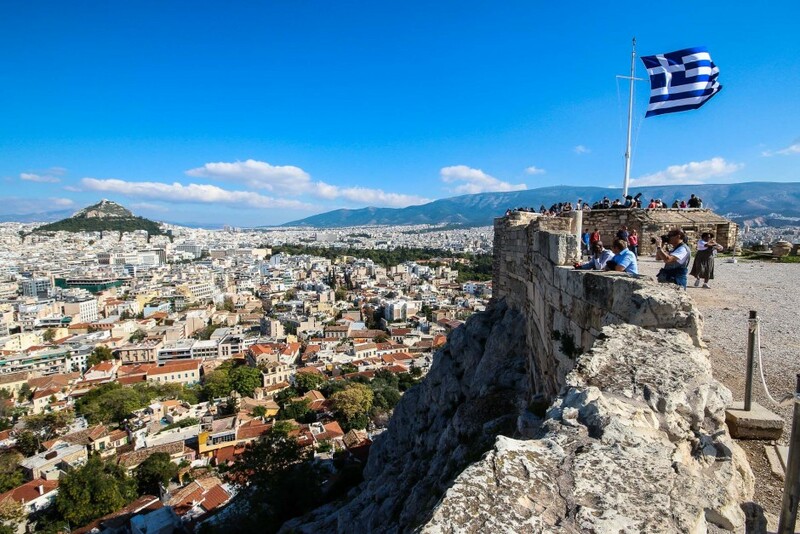 Visiting the Acropolis - a rocky outcropping in the heart of Greece’s capital - was definitely a highlight. While I try to shy away from the tourist trail, standing before the Parthenon’s imposing marble columns and the Old Temple of Athena was powerful and humbling. These structures, built in the 4th century BC, have withstood many battles. The hilly village of Palaios Panteleimonas was instantly likable. Leafy plazas, cobbled lanes and glimpses of the Aegean Sea through gaps between stone houses, all made for a highly enjoyable morning walk. The Periera Region of northern Greece reminded me of the Central Coast back home in California. A place where mountains meet coastline, and Mediterranean style homes dot the hillsides. 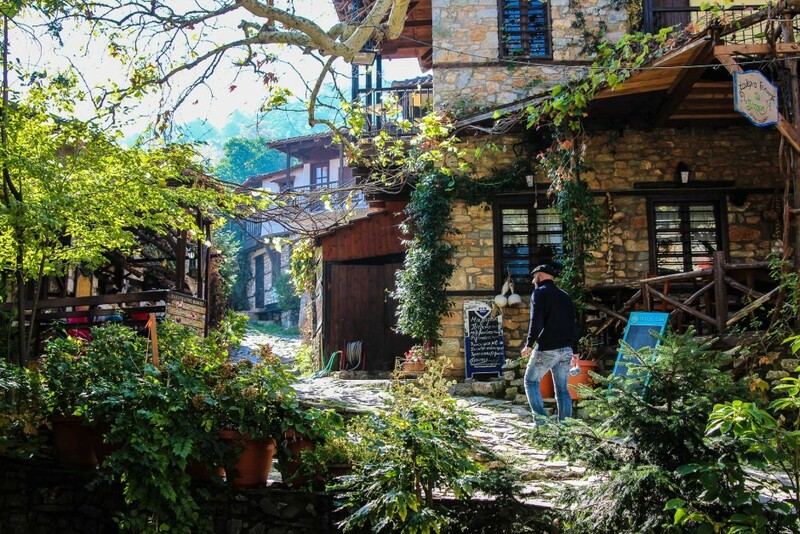 "For me," George said, "this is one of the most beautiful villages in Greece." Despite missing the weather window for summiting Mt. 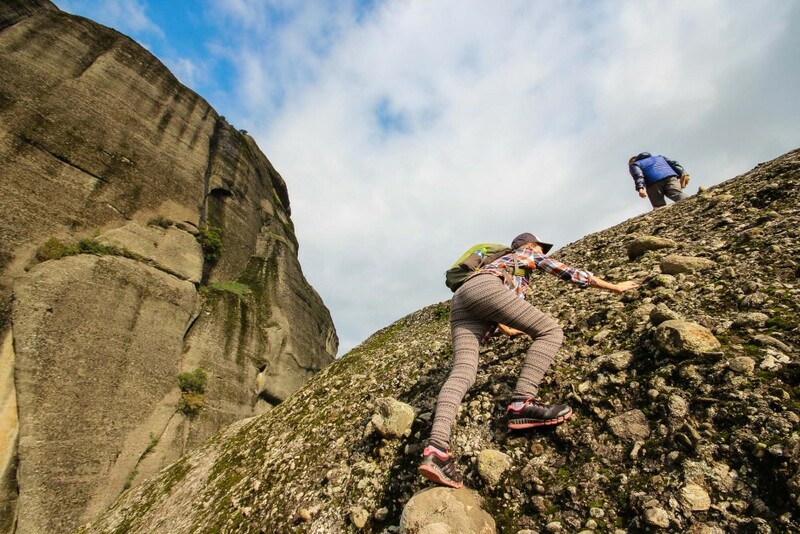 Olympus (9,570 ft.), I joined an alternative hike with local guides down the Enipeas Gorge. 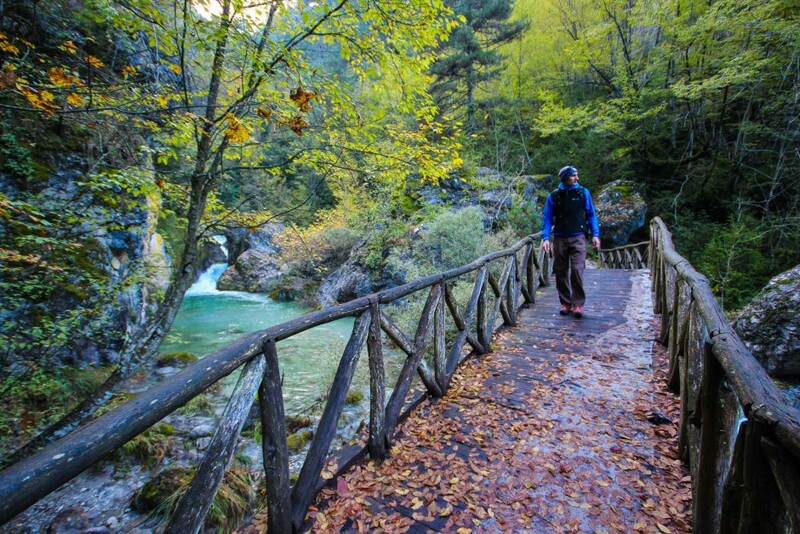 The E4 trail meandered along the Enipeas River, passed through dense woodland and gave way to views of distant cliffs from timber bridges. I plan on returning someday. Being able to say I’ve climbed Mt. Olympus is too irresistible. 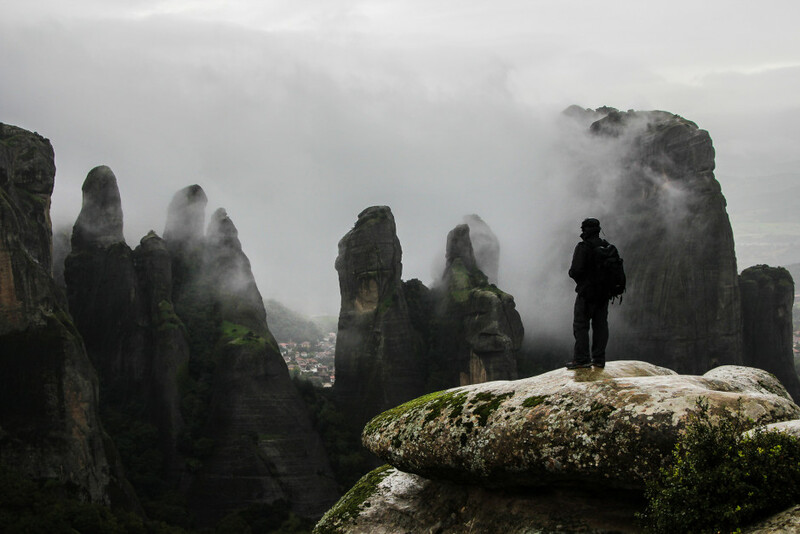 Roughly translated, Meteora means "suspended in the sky". 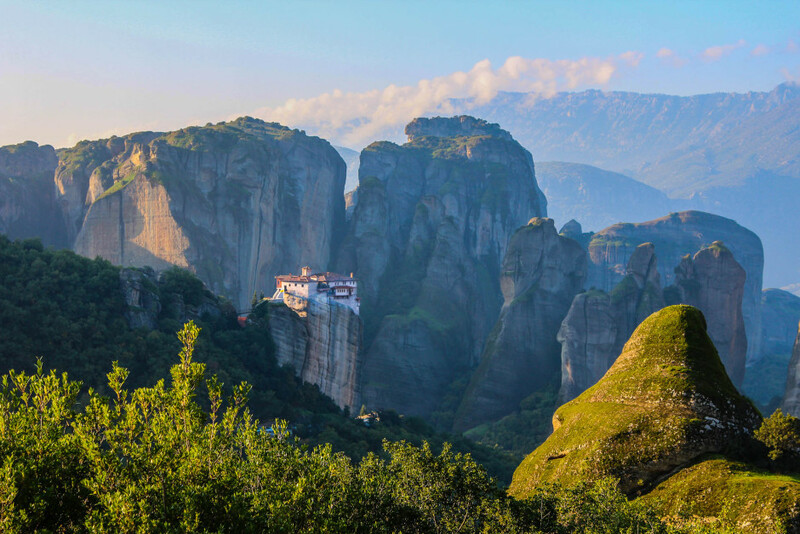 Above, the Varlaam Monastery, following misty morning showers. Built in 1517, Varlaam supposedly once contained the finger of St. John and the shoulder blade of St. Andrew. While humans have inhabited local caves for over 50,000 years, the ascetical hermit monks settled here in the 9th century. They lived in fissures and caves until the collapse of the Byzantine Empire brought Turkish raiders. Seeking refuge, the monks ascended the stone pillars and began constructing early versions of the monasteries we see today. The view from my room at the Cavo Olympo Hotel coaxed me out of bed. I spent the next half hour wandering the terraces and shoreline while the sun rose.